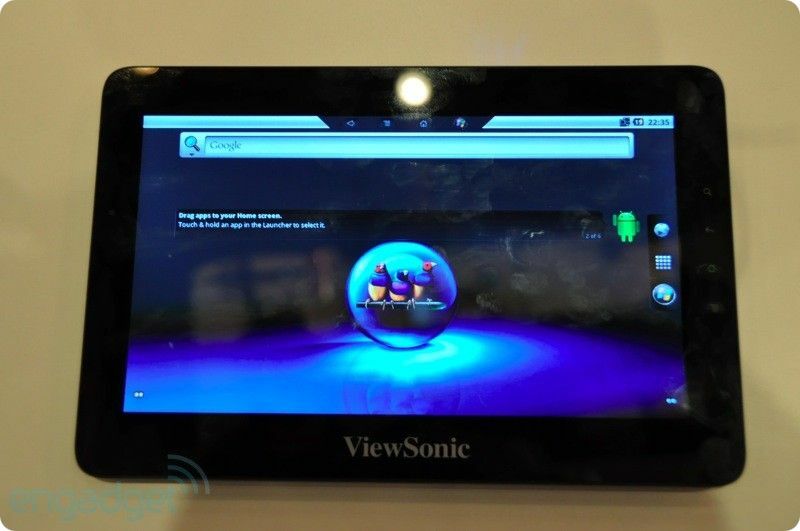 Anche ViewSonic ha preso parte al Computex 2011, presentando le sue proposte di tablet: ViewPad 10Pro, un 10" introdotto per la prima volta al CeBIT dello scorso Marzo con dual-boot Android 2.2 e Windows 7 Pro, e ViewPad 7x, un 7" con Honeycomb di cui si era chiacchierato qualche tempo fa. Il primo, nell’immagine ad inizio articolo, presenta un processore Intel Oak Trail Z670 da 1.5Ghz, un display da 10 pollici con risoluzione di 1024×600 pixel, connettività 3G, 32GB di memoria interna, slot microSD, USB e una batteria da 3500mAh, in grado di garantire 4.5 ore di riproduzione video in fullHD. Verrà venduto in una configurazione con doppio sistema operativo Windows 7 Pro / Android 2.2 Froyo (non si tratta di un vero dual-boot ma di una virtualizzazione di Android in Windows), ma al momento non sono stati ancora comunicati prezzo e disponibilità. Contiamo di saperne di più a breve! Il secondo invece, il ViewPad 7x, è dotato di un display da 7 pollici con risoluzione di 1024×600 pixel, sistema operativo Honeycomb 3.0.1, processore Tegra 2, uscita HDMI e connettività HSPA+, per un peso totale di ~380 grammi. Anche per questo, però, resta da conoscere prezzo e data d’uscita. Computex, Taipei, 31 May 2011 – ViewSonic, a leading global provider of computing, consumer electronics and communications solutions, is set to surprise at Computex Taipei 2011 with its strongest-ever audio and visual solutions. It will be showcasing a wide range of high-definition entertainment offerings and the latest innovations. Products released last year have won rave reviews in the industry; this year promises more of the same. Products span from tablet PCs, high-performance smartphones, latest 3D Full HD LED monitors, to projectors, digital photo frames and digital camcorders. ViewSonic will be located at Booth L0832, 4th floor, Nangang Exhibition Hall from 31 May to 4 June and is inviting everyone to ‘See the difference’. The ViewPad 7x will be making its first official appearance. The ViewPad 7x is a seven-inch HoneyComb tablet that utilises a NVIDIA dual-core processor and promises users HSPA+ for greater Internet browsing and a enhanced multimedia experience. 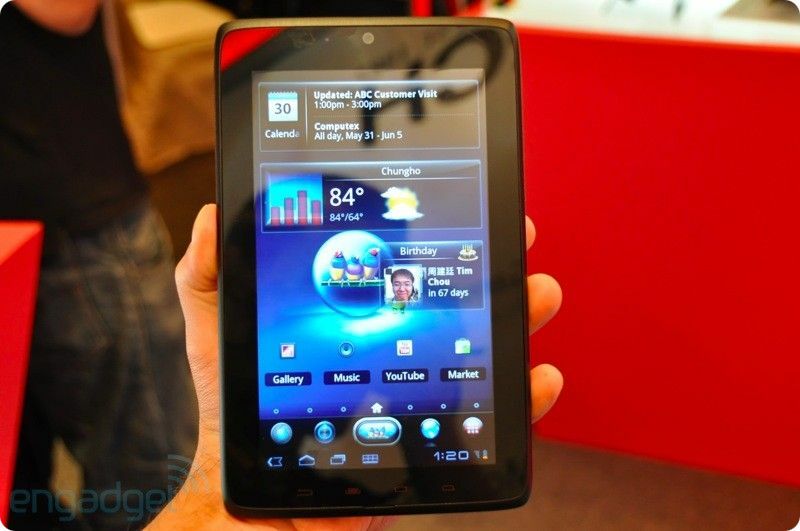 The ViewPad 10Pro is the world’s first dual-OS tablet that has both Windows 7 Professional and Android at your service. It is also one of the first tablets to use the latest Intel Oak Trail processor. The new Intel processor is powerful, yet offers amazing power savings which delivers the perfect combination of Windows technology in a mobile touch screen device. In addition to tablet PCs, ViewSonic is also announcing advanced AV solutions that include the V3D245wm-LED, a 24-inch 3D Full HD LED monitor; the W200, an ultra-thin and lightweight WXGA pico projector; the WFM851, a slim and sleek digital photo frame; as well as a range of HD digital camcorders. ViewPad 7x – the 7-inch HoneyComb tablet: Uses a dual-core NVIDIA processor and offers the fastest-ever HSPA+ for a greater Internet browsing experience compared to rivalling products in the same category. Weighing only 380g, with front and back cameras this powerful device provides video conferencing on the go that has to be seen to be believed. The high quality LED display is capacitive 10-point multi-touch, offering far more possibilities than standard screen offerings. Incorporating a HDMI port , DLNA support and SRW TruMedia the ViewPad 7x is a flexible multimedia device that delivers quality in a high quality package. ViewPad 10Pro – the world’s first dual-OS tablet that uses Windows 7 Professional and Android, and the first to use the latest Intel Oak Trail processor: This tablet, powerful in both hardware and software, is ideal for users who wish to have a combination of entertainment and professional needs. It allows for an instantaneous switch between the two OSes without turning off the tablet – Android for simple tasks such as Web browsing and Windows 7 for business applications. The V3D245wm-LED – An industry first, a 24″ smart monitor with a built-in 3D emitter: Presenting 20,000,000:1 maximum contrast ratio for great colour accuracy and high level of picture details the monitor features an ultrafast 2ms response time, 16:9 widescreen, Full HD 1080P, and scanning rate at 120Hz. The V3D245 supports the latest HDMI 1.4 input for future proofing realistic 3D content and fully supports current mainstream 3D devices. With the built-in SRS Premium Sound, the V3D245 is the ultimate 3D monitor. The PLED-W200 – the world’s first WXGA pico projector: pocket-sized projector ideal for slipping into a laptop bag or purse for taking presentations and entertainment on the go. At 200 lumens, with a 2000:1 contrast ratio and display resolution of 1200×800 WXGA, the PLED-W200 packs the world’s highest lumen and resolution counts into a CD player-sized device. It weighs only 420g and boasts long-lasting LED light technology of up to 20,000 hours. Teamed with integrated 10w speakers and a SD/USB card reader, users can present and enjoy everything from image slideshows to presentations in a PC-free environment. The VFM851 – ultra-thin digital photo frame: amazing design combined with high picture quality. Able to be battery powered offering a cordless experience it has 800×600 screen resolution, supports formats such as MJPEG, MPEG2, MPEG-4 and comes with USB ports (for SD/SDHC/MMC). The ViewSonic HD camcorder series: The new ViewSonic Camcorder HD series provide a lot of advanced features normally found in professional camcorders but at a fraction of the price. With a 10MP image sensor and 12X optical zoom, these HD camcorders capture great detail even at 200 feet away. And with a 60fps high-definition video available, the ViewCam HD series is perfect for sports and other action shots. The camcorder’s innovative advanced Manual Focus System lets you select what subject to focus on by simply tapping on the touch screen, ensuring what you want to be focused on is captured in detail.